Contestants of the 2018 Vodafone Festival of the Friendly North graced Savusavu Town in their kalavata (uniforms) as they toured the town area yesterday. The visit at the Pearl Farm was part of the one-day educational tour of Savusavu organised by the Labasa Festival Committee. Twelve queen contestants and four king contestants took part in the tour. 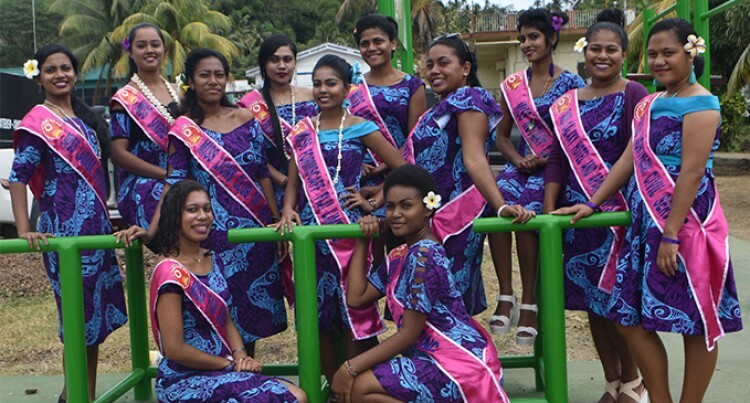 Miss Fiji Sugar Corporation Ateca Ledua said it was a great learning experience for her and the other contestants. “For some of the contestants, this was their first time to be at the Hidden Paradise,” Ms Ledua said. “Then we went to Savusavu Town Council, Koro Sun Resort, Namale Resort for a photoshoot, J Hunter Pearl Fiji Limited, Jean Michel Cousteau Resort and ended the tour at Nawi Island. “The Savusavu tour is an annual programme in our calendar which we use to promote our festival. Although the weeklong festival will be held at Subrail Park in Labasa, it is organised for everyone in the Northern Division. “It is not confined to Labasa people, it is for everyone and this is why we included the Savusavu tour in our programme, so that the contestants understand this insight,” Ms Ledua said. Miss Lions Club Salaseini Kulinidilo said it was great to see how pearls are made. “They showed us the whole processes involved to produce Fiji pearls. “This is the first time for myself to witness how pearls are made I am glad to be part of the tour,” Ms Kulinidilo said. The carnival’s theme this year is “Our Health our Future” and the event opens on August 18.